David Hasselhoff asks you to please, if it's not too much trouble, refrain from hassling him. 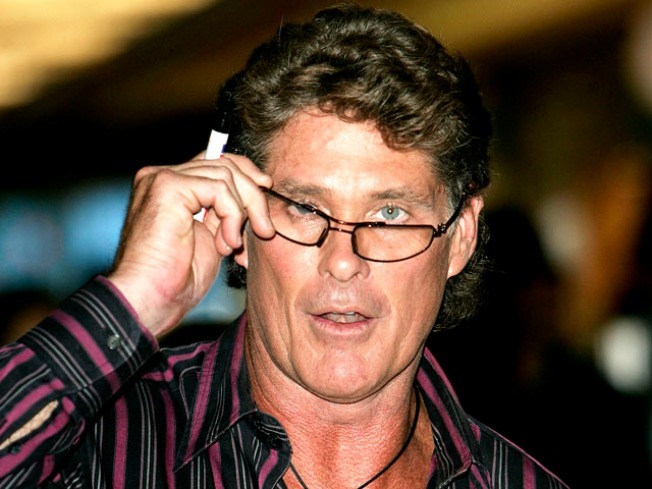 Quick, answer without thinking: What's the last factoid you remember about David Hasselhoff? Maybe it's him announcing that he's stopped drinking. Chances are it's the footage shot by his daughter in a Vegas bathroom not long after the announcement, depicting a shirtless, fitshaced Hoff trying to eat a burger and repeatedly missing his mouth. (Possibly, you may also remember him weeping openly during the finale of American Idol.) In short, Hasselhoff's celebrity stock was worth what all real stock is now, which is to say, a whole lot of not much. But don't make the mistake of underestimating the Hoff -- and not just because it could get you in trouble with the German government. Because the Hoff, you see, is comfortable with his own status as a pop culture punchline. And the song (and accompanying video) "Don't Hassel the Hoff" proves it with gentle, wicked parody. In the video, Knight Rider himself -- accompanied by a retro '80s band -- asks you to just give him a break, already. There's something about his "billions of fans," and his "blue eyes that yearn," and -- well, just check it out for yourself, over at The Soup blog. It makes you want to reach through cyberspace and give the Hoff an Obama-style fist bump.